Yup, she wasn’t transparent or open about the process, so she deserves the scrutiny that she is getting. Agreeing with a recent New York Times editorial, which blasts the Clintons for not coming clean about their foundation’s donations from foreign governments, CNN’s John King and his guests said that the scandal won’t go away anytime soon. 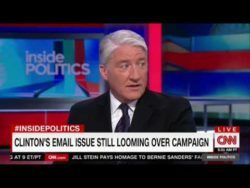 CNN’s John King asks why the Clintons have a “blind spot” with their fundraising.